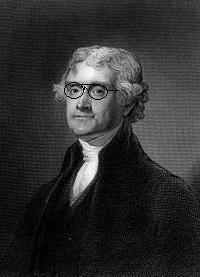 Thomas Jefferson, here imagined with glasses, argued Jesus is best seen as a kind of moral philosopher. Hey at least Jefferson was a Diest. I am not quite sure what Crossan is. Why, he's a "croissant" of course.